Earlier today, Bernadette Meehan shared the message below with our full email list ahead of the Leaders: Africa convening in Johannesburg, South Africa July 14-18. If you would like to receive updates about the event, you can sign up for our email list here. This week, President Obama will travel to Africa for the first time since he left office—and I’m honored to be joining him. We’ll be bringing together 200 emerging leaders from across the continent to explore new ways to take on the biggest challenges in their communities. We’re calling it Leaders: Africa. This is the kind of program where a young tech entrepreneur from Algeria might have a conversation with a human rights activist from Burundi—where a Congolese refugee whose family fled tribal conflict might meet a Secretary of State from Cape Verde. We can’t wait to see what they come up with together—and how they’ll go on to change Africa in the months and years to come. Meet the 200 members of inaugural class of African leaders—and follow along with the entire trip right here. On Tuesday, July 17th, President Obama will deliver the 16th Nelson Mandela Annual Lecture in Johannesburg. He’ll talk about how we can create the conditions to bridge divides, make change across ideological lines, and work together to resist oppression and inequality. The following day, July 18th, marks Mandela Day—the 100th anniversary of the South African leader’s birth—and people around the world will be honoring him by making a commitment to help make the world a better place. You should listen in to President Obama’s remarks, to be sure—but you should do something else, too. You should make a commitment of your own. It can be something large or small, local or global. It might mean coming up with a brand new idea, or joining an existing effort. Honor the legacy of Nelson Mandela by making a commitment right now, right here. 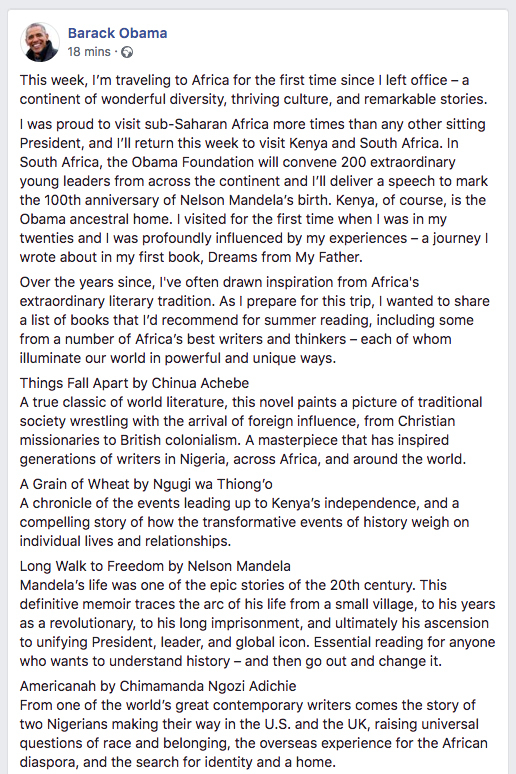 This morning, President Obama shared a few books that he’d recommended reading—many of which are written by some of Africa’s most talented writers, and all of which draw upon themes from the upcoming trip. I’ve passed that list along, with a note from him, below. Take a look, and get ready to be inspired this week. This week, I’m traveling to Africa for the first time since I left office—a continent of wonderful diversity, thriving culture, and remarkable stories. I was proud to visit sub-Saharan Africa more times than any other sitting President, and I’ll return this week to visit Kenya and South Africa. In South Africa, the Obama Foundation will convene 200 extraordinary young leaders from across the continent, and I’ll deliver a speech to mark the 100th anniversary of Nelson Mandela’s birth. Kenya, of course, is the Obama ancestral home. I visited for the first time when I was in my twenties and I was profoundly influenced by my experiences—a journey I wrote about in my first book, Dreams from My Father. Over the years since, I’ve often drawn inspiration from Africa’s extraordinary literary tradition. As I prepare for this trip, I wanted to share a list of books that I’d recommend for summer reading, including some from a number of Africa’s best writers and thinkers—each of whom illuminate our world in powerful and unique ways.